The holiday season is already busy enough as it is. Between the parties, work functions, gift shopping and family gatherings, there’s little time to spare! That’s why sanity-saving tricks like this tip for making homemade frosting ahead of time and storing it for later use come in handy during the holiday baking season. The first step is to start with your favorite recipe for homemade frosting. Don’t have a favorite? 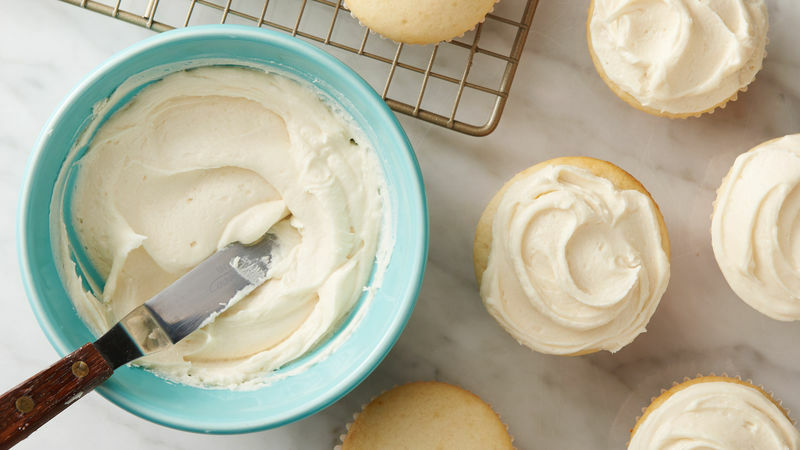 Try this ridiculously easy, four-ingredient vanilla buttercream frosting. Not only does it taste incredible on cupcakes, cookies, cakes, or even right out of the bowl (yes, we checked), but it freezes well, too! That’s right, you can freeze buttercream frosting! But to preserve the sweetness and the texture, there are a series of steps you should follow. Step 1: Using a medium bowl, mix the powdered sugar and butter with an electric mixer on low speed. If you don’t have a mixer, you an do this with a spoon. Stir in vanilla and 1 tablespoon of the milk. Step 2: Continue to beat the mixture while gradually adding more milk until the frosting is smooth and spreadable. If the frosting seems too thin, add more powdered sugar. If the frosting seems too thick, add more milk. Now a few must-have tips here, before we continue. For the best taste and consistency, you should use real vanilla; it enhances the rich flavor and sweetness. Also, make sure you use room temperature butter. The butter and powdered sugar will blend together more smoothly. Obviously you can use your frosting right away. And it goes without saying, you should go ahead and sneak a spoonful straight from the bowl at this point. But if you’re trying to get ahead of the holiday craze or want to make a large batch, you can store your frosting in the freezer by simply placing it into a container with an air-tight lid and putting it in the freezer. However, if you place plastic wrap directly onto the surface of the frosting before you put the lid on, you can prevent those troublesome frosty ice crystals from forming. It’s an optional step and not totally necessary, but we highly recommend it! If properly sealed, the frosting will last in the freezer for several weeks. To defrost, take the frosting out of the freezer the night before you’ll need to use it and thaw it in the refrigerator overnight. When you’re ready to frost your dessert, remove the frosting from the fridge and give it time to come to room temperature. Depending on how warm your kitchen is, this could take up to an hour or so. When the frosting has reached room temperature, stir it until it reaches a spreadable consistency, and then frost away! At this point, feel free to add food coloring, additional flavor, or leave it as is and decorate with sprinkles. However you choose to use your homemade frosting, you can’t go wrong with this recipe or this make-ahead tip, because you never know when you’re going to need frosting on the double!